The Boss CH-1 Chorus Pedal takes the input audio signal from your guitar or keyboard and mixes it with delayed and pitch-modified versions of itself, with no feedback. This creates the characteristic rich, shimmering quality that you get when multiple voices are heard in tune with each other. Along with the crystal-clear highs of the effect the Boss CH1 Chorus Pedal offers stereo outputs to hook up to dual amps. This gives the same effect as a single amp but with the ability to vary the sound between two amps to create an atmospheric, three-dimensional ambience with the sound coming from multiple locations in the stereo sound field. With Effect Level, EQ, Rate and Depth knobs the Boss CH-1 Chorus Effect Pedal gives you full control over your sound with enough scope to produce a longer delay between the input signal and the chorus and increased reverberation. 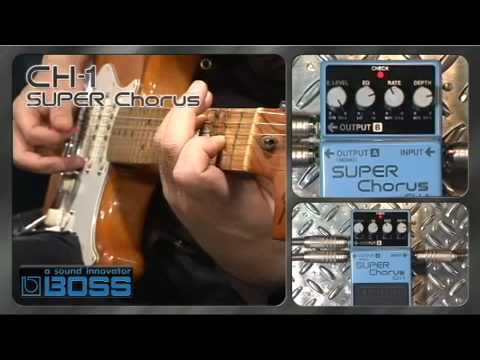 Of course, manufactured by one the biggest producers of effects pedals the Boss CH-1 Pedal is made to last. The compact housing and control knobs are robust and ready for life on the road, and Boss back up their confidence in their product by offering a 5-year warranty for customers who register their pedal. Despite holding a 9V battery (AC adapter available separately), and its robust build, the Boss CH-1 Chorus Effects Pedal is also surprising lightweight, at just 400 grams.